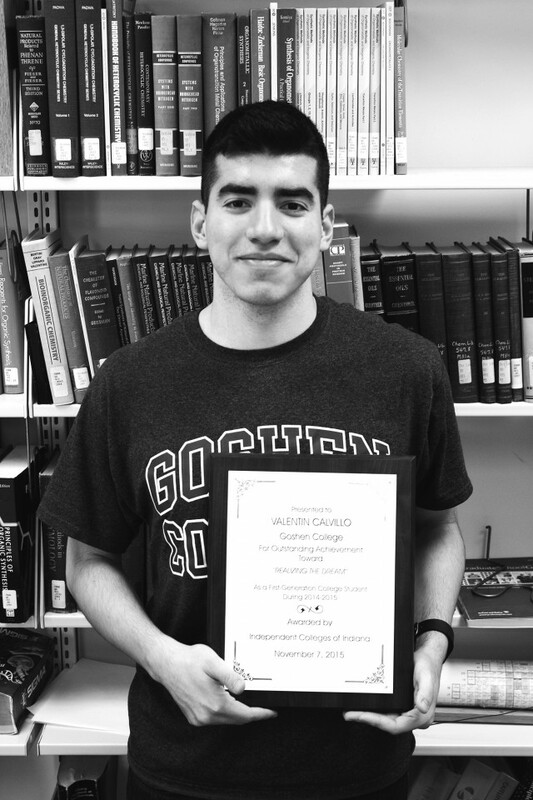 Valentin Calvillo was a recipient of the 2015 “Realizing the Dream” scholarship. It’s four o’clock in the morning. Some college students are finally heading to bed, but Valentin Calvillo’s parents are getting up for work. For the last 20 years, Calvillo’s parents have worked in factories. Calvillo, a sophomore, is a first-generation student. “[My parents] were really proud of me because I decided to go to college,” Calvillo said. But his goal isn’t simply a bachelor’s degree; Calvillo is aiming for medical school. Majoring in biochemistry, Calvillo wants to become a general surgeon, or do something related with surgery. Calvillo hopes to work with an organization like Doctors Without Borders or the Red Cross in order to go overseas and “help out people who truly need medical help.” He would like to travel to Palestine, Syria or maybe Africa—anywhere that there is a need. On Nov. 7, Calvillo traveled to Indianapolis for the “Realizing the Dream” banquet, where he and nearly 35 other first-generation students from colleges across Indiana were honored. Each student was awarded a $2,000 scholarship. The students also selected a teacher or mentor that had been influential in their lives. Those significant people received $1,000 for educational purposes. Calvillo selected Josh Duell, his student resource time teacher at Goshen High School. Calvillo has found that having people in his life that he can rely on for help has been a key part of his success. Calvillo was nominated for the Realizing the Dream award by DaVonne Kramer, coordinator of retention and intercultural student support, as a first-generation student who shows student leadership roles. Calvillo is a resident assistant and a member of Student Senate, among other things.